Jill Evans MEP was born in the Rhondda in 1959 where she still lives. Jill attended University in Aberystwyth and then worked as a Research Assistant at the former Polytechnic of Wales where she gained her M.Phil. Degree. She worked for the National Federation of Women's Institutes in Wales for six years before taking up a post as Wales Regional Organiser for CHILD - The National Infertility Support Network. Jill was a councillor for six years - on the former Rhondda Borough and Mid Glamorgan County Councils and then Rhondda Cynon Taff County Borough Council. 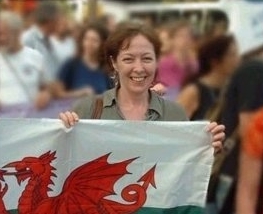 She was elected as Plaid Cymru's Alternate Member of the Committee of the Regions in 1993 and served for four years, and was also the party's representative on the European Free Alliance, working with Plaid Cymru's sister parties throughout the continent. Jill Evans was Chair of Plaid Cymru 1994-96. In June 1999 Jill Evans and fellow candidate Eurig Wyn were elected as the first MEP's in Plaid Cymru's history. Jill is now the leader of the Plaid Cymru European Parliamentary Party. Plaid Cymru - the Party of Wales is a member of the Green / European Free Alliance Group - the fourth largest group in the Parliament. She is Vice-President of the Committee on Women's Rights and Equal Opportunities, and is a member of the Committee on Employment and Social Affairs. She deputises on the Committee on the Environment, Public Health and Consumer Policy, and is a member of the EU-Lithuania Joint Parliamentary Committee and the Temporary Committee on human genetics and other new technologies of modern medicine. Jill Evans has been actively involved in the peace movement for 25 years and is presently Chair of CND Cymru. She visited Coedcae during the early phase of the war against Iraq, having heard about the Peace Mala. The present political situation has made me feel very depressed. Meeting these young people today and learning of their commitment to the Peace Mala has given me some hope for the future. It has lifted my spirits. Imran Sheikh presented Jill with a Peace Mala. She also took away several other Peace Malas with the intention of making other European MPs aware of the project and its vision for world peace. I am particularly proud that this wonderful project originated in Wales. I hope, within the next few weeks, to have the opportunity of presenting a Peace Mala to His Holiness Pope John Paul, who will be attending the European Parliament.